Legend to Figure 1 reporting system for safety events. Patient Safety Event: a safety event that reached the patient. Potential Patient Safety Event: a safety event that did not reach the patient. Harm. Harm caused by the patient safety event; further classified by severity using either the SAC matrix here, or the Merck index (E~I). Serious Harm: documented harm resulting in death, .., ., as in the Harvard and Australian studies. Potential harm severity (near miss): as in RCA^2 to decide if catastrophic results might have occurred, the indication for a Root Cause Analysis. Adverse drug event (ADE) is defined as harm experienced by a patient as a result of exposure to a medication. As with the more general term 'adverse event', the occurrence of an ADE does not necessarily indicate an error or poor quality care. 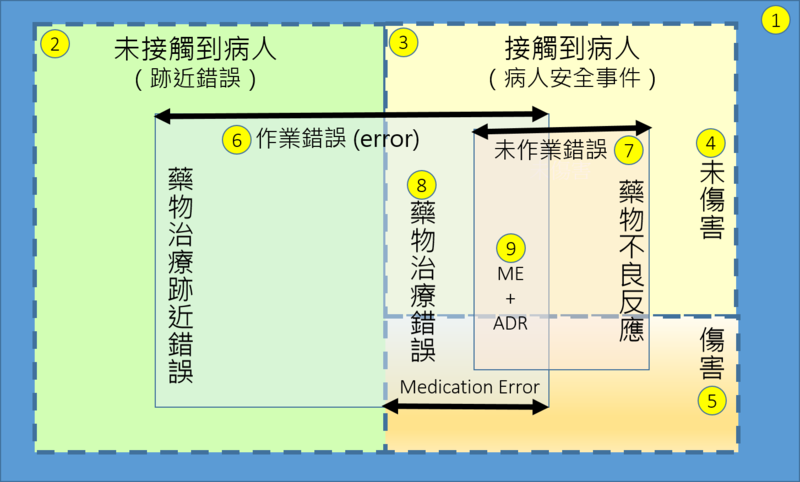 A medication error refers to a error (of commission or omission) at any step along the pathway that begins when a clinical prescribes a medication and ends when the patient actually receives the medication. These are all considered preventable. A certain percentage of patients will experience ADEs even when medications are prescribed and administered appropriately; these are considered adverse drug reactions (ADR) or nonpreventable ADEs. 任何非計畫或非預期性，可能會導致接受醫療服務的一位或一位以上病人傷害的事件。 [ACHE] Any injury caused by medical care. An undesirable clinical outcome that has resulted from some aspect of diagnosis or therapy, not an underlying disease process. Preventable adverse events are the subset that are caused by error. Error: An act of commission (doing something wrong) or omission (failing to do the right thing) that leads to an undesirable outcome or significant potential for such an outcome. 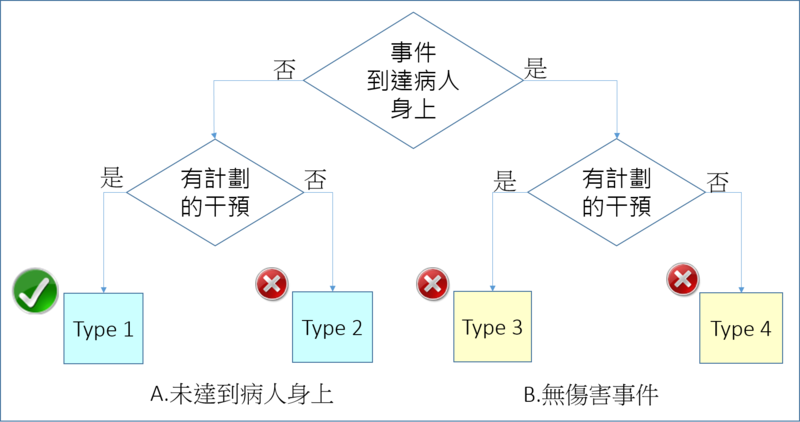 發生實際損傷 Reached patient (Patient Safety Event), further subdivided into whether the event caused patient harm. Figure 2. 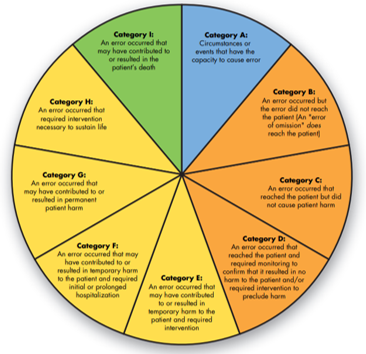 Venn diagram of safety events, showing the role of medication events. Ferrante P. Incident vs. Accident: What's the Difference? 2011-09-16. 5. Sheikhtaheri A. (2014) Near Misses and their importance for improving patient safety. Iran J Public Health. 2014; 43(6): 853-854. 7. Aspden P (2004). Patient safety: achieving a new standard for care. Institute of Medicine; USA. 9. Aston E, Young T (2009). Enhancing the reporting of "near miss" events in a children's emergency department. J Emerg Nurs, 35(5): 451–452. 10. Kessels-Habraken M, Van der Schaaf T, De Jonge J, Rutte C (2010). Defining near misses: Towards a sharpened definition based on empirical data about error handling processes. Soc Sci Med, 70(9): 1301–1308. 11. Lamb BW, Nagpal K. (2009) Importance of near misses BMJ, 2009; 339(3):b3032.